The E-Ring: Is Hagel a prepper? Transitions: Can Indonesia’s main Islamist party recover from scandal? We're busy building our media site. In the meantime, click here to learn more about FP and advertising opportunities. More than 1,000 State Department employees gathered in the main lobby of the department's Truman Building headquarters Friday afternoon to hear Hillary Clinton deliver her last remarks as secretary of state before she walked out the front door and left Foggy Bottom -- perhaps -- forever. Deputy Secretary of State William Burns introduced Clinton as she stood along with Deputy Secretary of State Tom Nides and Under Secretary for Management Patrick Kennedy on the mezzanine overlooking the building's C Street Entrance. "Madam Secretary, four years ago I stood on the same spot and had the honor of introducing you to the men and women of the Department of State. From that first day on, you've touched the lives of millions of people around the world, you've left a profoundly positive mark on foreign policy, and you've done enormous good for all of us and for the country we serve," Burns said. "We will miss you deeply." "I cannot fully express how grateful I am to those with whom I've spent many hours here in Washington, around the world, and in airplanes," Clinton said. "But I'm proud of the work we've done to elevate diplomacy and development, to serve the nation we all love, to understand the challenges, threats, and opportunities the United States faces, and to work with all our heart and all of our might to make sure American is secure, that our interests are promoted, and our values are respected." Clinton also mentioned Friday's terrorist attack on the U.S. Embassy in Ankara, Turkey, where a suicide bomber detonated a vest laden with explosives at an outer barrier checkpoint, killing himself and one Turkish national who was guarding the embassy. Another embassy guard was seriously wounded. Clinton said she spoke with U.S. Ambassador to Turkey Frank Ricciardone and Turkish Foreign Minister Ahmet Davotoglu today. "I told them how much we valued their commitment and their sacrifice," Clinton said. "I know the world we are trying to help bring into being in the 21st century will have many difficult days, but I am more optimistic today than when I stood here four years ago." Clinton promised to be an advocate from the outside promoting diplomacy and development and said her last week of saying goodbye had been bittersweet. "I am very proud to have been secretary of state. I will miss you. I will probably be dialing [the State Department operations center] just to talk," she said. "Next week, I would expect that all of you would be as focused and dedicated to Secretary Kerry as you were for me." In a goodbye e-mail to State Department employees, Clinton said she would miss several things about the State Department, including State's penchant for using acronyms for everything. "In fact, I created a few of my own," she wrote. "NY/WJC and NY/CVC - who I used to simply call Bill and Chelsea - are my newest advisors. Instead of S, now I'll just be HRC. I'm also thinking of turning my Chappaqua house into a SCIF, but I will not/not check my new iPad at the door." In the crowd, State Department employees cheered for Clinton and snapped as many final photos of her as they could. They also discussed what the new regime at State would bring and exchanged speculation about which senior State Department officials would be staying or leaving, and who might replace them. Most of the seventh-floor senior staff could stay put, so go the rumors, but several of the mid-level positions, especially at the assistant secretary or deputy assistant secretary level, are expected to change hands. "It's a good day but a sad day," one State Department official in the crowd told The Cable. "I think it reflects the enthusiasm and support that Secretary Clinton has garnered over the last four years that so many people came here to wish her well and show her support -- not just Hillary Clinton the secretary but also Hillary Clinton the person." Meanwhile, Kerry was sworn in as the new secretary Friday afternoon in a private ceremony; the State Department refused to disclose the location. 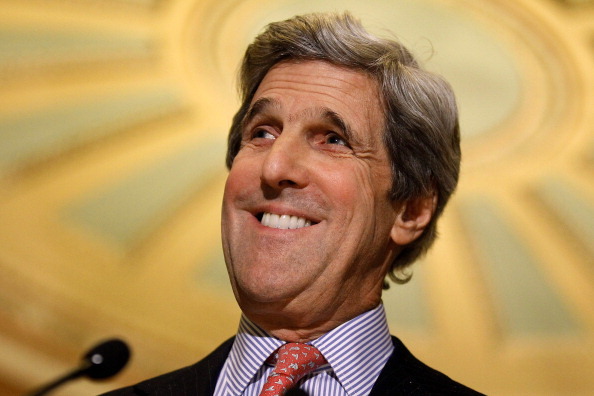 Kerry's first day at State will be Monday, and there will be a public swearing-in as well. There's a lot of enthusiasm at the State Department about Kerry's arrival, but also much uncertainty about how much change he will bring. "People are hopeful that he can carry on a lot of the strategic direction that Secretary Clinton set forth and that he can bring in his own brand of leadership but also not deviate from the path that Secretary Clinton has put us on," the State Department official said. Vice President Joe Biden is on a tour of Europe that will include stops in Germany, France, and Britain and meetings with leaders from Russia, the United Nations, and the Syrian opposition. The White House is framing the trip as chance for Biden to reassert the importance of the trans-Atlantic relationship at the beginning of President Barack Obama's second term. Biden will start by attending the Munich Security Conference, which he last attended in 2009. "Now he's going back at the start of the second [term]... to take stock of what we've accomplished over the past four years and to look at the agenda going forward," said Tony Blinken, Biden's outgoing national security advisor, who will soon move into his new role as the principal deputy national security advisor at the National Security Council. "It's no coincidence that the vice president went to Europe then and returns to Europe now to help set out our foreign-policy agenda. As President Obama has said, Europe is the cornerstone of our engagement with the world and a catalyst for global cooperation." Biden left Washington Thursday evening and arrived in Berlin Friday morning for a meeting with German Chancellor Angela Merkel. Friday evening he arrives in Munich, where he will give a speech and hold a series of meetings on Saturday. Biden will meet with Russian Foreign Minister Sergei Lavrov, with Lakhdar Brahimi, the U.N. and Arab League Joint Special Representative for Syria, and with Moaz al-Khatib, the president of the Syrian opposition council. "We'll be discussing our continued political and non-lethal support to the opposition that is helping them coalesce and become more organized and provide certain services like medical services to the Syrian people," said Ben Rhodes, deputy national security advisor for strategic communications. "And we'll be discussing the political way forward. And what we would like to see from other countries, including Russia, is an acknowledgement that Bashar al-Assad must go and that there needs to be a transition within Syria to a new government." Rhodes also confirmed that Biden and Lavrov will discuss the potential for new nuclear reductions negotiations, as The Cable reported this week. "On this question of further reductions, the president has spoken to this in the past. For instance, if you look at the speech he gave in Seoul in the spring of last year, he indicated that even as we move forward with the New START reductions and deployed warheads and launchers, that he believes that there's room to explore the potential for continued reductions, and that, of course, the best way to do so is in a discussion with Russia," said Rhodes. "We'll obviously have to carry forward that dialogue going forward." Saturday evening, Biden will attend Bavarian minister Horst Seehofer's dinner, which honors former National Security Advisor Brent Scowcroft. At last year's Munich Security Conference, the dinner honored former Sen. Joe Lieberman (I-CT). On Sunday, Biden and his wife will visit the Landstuhl Regional Medical Center before leaving for Paris later Sunday afternoon. On Monday Biden will meet French President François Hollande before moving on to London, where on Tuesday he will meet with Deputy Prime Minister Nick Clegg and Prime Minister David Cameron for a working lunch at 10 Downing Street. Following lunch, Biden will attend a meeting of Britain's National Security Council. Blinken said that in his Paris and London stops, Biden will be discussing the ongoing crisis in Mali and ways to increase the ongoing U.S. support for the French-led mission there. "What we're seeing across North Africa and parts of the Middle East is an extremist threat that is fueled by the reality of porous borders, ungoverned territory, too readily available weapons, increasing collaboration among some of these groups, and, in many cases, a new government that lacks the capacity and sometimes the will to deal with the problem," Blinken said. "And so this requires a comprehensive approach, as Ben said, bringing to bear our political and economic tools, as well as our military tools, but it also requires a common approach. And so this trip is an opportunity, in all of its stops, for the vice president to confer with leaders about that and to look forward to how we can continue to work together and strengthen our common efforts to deal with this challenge." 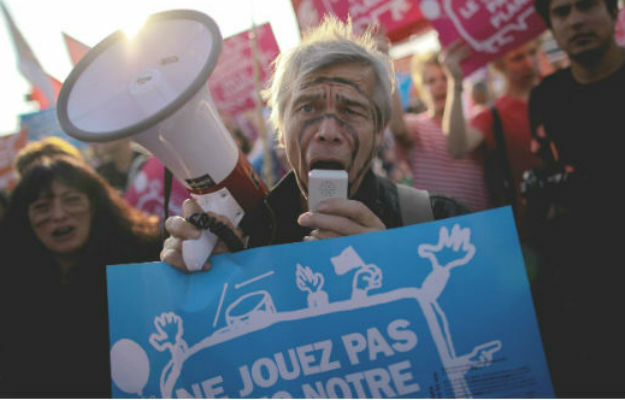 Is France on the Verge of a Nervous Breakdown? Secretary of State Hillary Clinton gave the final major speech of her tenure Thursday to a packed house at the Council of Foreign Relations' offices in Washington in advance of her successor John Kerry's official swearing-in ceremony Friday. "Tomorrow is my last day as secretary of state, and though it is hard to predict what any day in this job will bring, I know that tomorrow my heart will be very full," she said. "Serving with the men and women at the State Department and USAID has been a singular honor, and Secretary Kerry will find there is no more extraordinary group of people working anywhere in the world. So these last days have been bittersweet for me." More than 300 people attended the speech, including senior State Department officials such as Melanne Verveer, Maria Otero, and Jake Sullivan, as well as outside luminaries such as Bush-era intelligence director John Negroponte and former Sen. Evan Bayh. Clinton used the opportunity to lay out the by-now familiar argument that America's economic, diplomatic, and security strength is greatly improved compared to when she and Obama came to office four years ago. "Under President Obama's leadership, we've ended the war in Iraq, begun a transition in Afghanistan and brought Osama bin Laden to justice. We have also revitalized American diplomacy and strengthened our alliances. And while our economic recovery is not yet complete, we are heading in the right direction," she said. "In short, America today is stronger at home and more respected in the world. And our global leadership is on firmer footing than many predicted." She also defended what she called her style of "shoe-leather" diplomacy, which has included vsiting 112 countries, logging nearly 1 million miles of travel, and accumulating almost 87 days of total flight time. "I have found it highly ironic that in today's world, when we can be anywhere, virtually, more than ever people want us to actually show up," Clinton said. "And people say to me all the time, I look at your travel schedule; why Togo? Well, no secretary of state had ever been to Togo, but Togo happens to hold a rotating seat on the U.N. Security Council. Going there, making the personal investment, has a strategic purpose." Clinton praised the State Department's outreach to non-governmental entities in foreign countries and touted the expansion of public diplomacy into new mediums, such as Twitter, during her tenure. She also railed against the Broadcasting Board of Governors, of which she is a board member, and said that organization was failing in its mission and losing ground to foreign competitors. "We have basically abdicated, in my view, the broadcast media," she said. "I have tried and will continue from the outside to try to convince Congress and others, if we don't have an up-to-date, modern, effective broadcasting board of governors, we shouldn't have one at all." The State Department would be hit hard by the budget cuts known as "sequestration" which would kick in as of March unless Congress intervenes, Clinton said. Civilian employees could be furloughed, security overseas could be cut, and citizen services like passports could be negatively impacted, she warned. She also said the United States must get more involved in helping Central American countries shore up their ability to protect their borders if the United States is serious about addressing the issue of illegal immigration. "At the same time that we do immigration reform, we need to do more on border security and internal security in Central America," she said, noting that illegal immigration from Mexico has tapered off. "I think we have to do more with the Central American countries in order to help them the way that we have helped others." CFR President Richard Haas closed the event by commenting, "At the risk of leaving you all with an image that probably isn't good, I would simply say that John Kerry has some fairly large Manolo Blahniks to fill." "That is very funny," Clinton replied. "Oh my goodness." Hagel's hearing before the Senate Armed Services Committee was often contentious and combative as the nominee sought to assuage Republicans about some of his previous controversial statements while defending other positions he has taken over his decades of public and private service. For example, Hagel apologized for using the term "Jewish lobby" and said that the pro-Israel lobby "influences" rather than "intimidates" Congress, correcting the record on comments he made years ago to Middle East scholar Aaron David Miller. But Hagel's comments on subjects ranging from Iran to Iraq to nuclear weapons were apparently not well-received by the GOP caucus, and several Republican senators told The Cable they were more inclined to opposed Hagel's nomination after his performance at the hearing. "I want to know if you were right or wrong. That's a direct question. I expect a direct answer," McCain said. "I think history has already made a judgment about the surge, sir, and you're on the wrong side of it. And your refusal to answer whether you were right or wrong about is going to have an impact on my judgment as to whether vote for your confirmation or not," McCain said. "It's not looking good," Graham said. "I don't think he's been consistent over time on major issues." Sen. Marco Rubio (R-FL) is not on the committee, but he told The Cable he watched it on television and concluded he would definitely vote against Hagel's confirmation. "I don't think he's going to be able the questions I'm going to have. I saw the hearing and I won't be able to support him," Rubio said. Sen. Jeff Sessions (R-AL) got into a heated exchange with Hagel at the hearing over the latter's participation in the Global Zero report, which calls for steep reductions in U.S. nuclear stockpiles. Sessions and Hagel debated whether the report actually calls for unilateral reductions in the U.S. nuclear armament or just suggests that as one possible option. "But here's the key part of all this -- and by the way, this was summarized in a letter to President Obama in 2009 -- bilateral, never unilateral -- nothing was ever suggested on a unilateral basis to take down our arsenal -- negotiated, verifiable," Hagel said. White House Press Secretary Jay Carney defended Hagel on the issue at Thursday's press briefing. "I have serious reservations about it," Sen. John Hoeven (R-ND) told The Cable. "I know Chuck. He's a good guy. I like him personally. But I have serious reservations about him becoming the secretary of defense." When the Hagel nomination does come before the full Senate, even non-committee Republicans say they will look back on today's testimony when making their decision. The Defense Department has no idea whether or not it is violating U.S. sanctions by indirectly purchasing Iranian oil for the Afghan security forces, according to a new report by the Special Inspector General for Afghanistan Reconstruction (SIGAR). The United States paid for the purchase and delivery of fuel to the Afghan security forces for years, totaling $1.1 billion for just the Afghan army since 2007. But the Pentagon's lack of internal controls means that some of that fuel might have come from Iran, the SIGAR office found. New checks and balances were put in place last year, but there is still a risk that U.S. taxpayer funds are being sent to Iran. "DOD's lack of visibility-until recently-over the source of fuel purchased for the ANSF raises some concerns," the new report stated. "DOD lacked certification procedures prior to November 2012 and had limited visibility over the import and delivery sub-contracts used by fuel vendors. As a result, DOD is unable to determine if any of the $1.1 billion in fuel purchased for the ANA between fiscal year 2007 and 2012 came from Iran, in violation of U.S. economic sanctions." The SIGAR office was following up on a few allegations of improprieties with the purchase of fuel for the Afghan forces from undisclosed sources. SIGAR didn't find any direct evidence that sanctions against Iran were being violated, but rather issued the report as a warning that the risk of sanctions violations exists. Between 2007 and 2012, there is no information on where the fuel that America was buying for the Afghan security forces was coming from, the report notes. "During that time, [the Defense Department] did not require vendors to provide information on the sources of fuel or certify that their fuel purchases complied with U.S. sanctions prohibiting transactions with Iran," the report says. New purchasing agreements signed last year included a new certification process that requires the contractors who use American money to purchase fuel for the Afghan forces to certify where that fuel is coming from. But there's no clarity on what exactly those contractors must do to validate their certifications and what oversight the U.S. government can perform to make sure the certifications are accurate, SIGAR officials told The Cable. "Our report again demonstrates the critical importance that oversight plays in the contracting process," Special Inspector General John F. Sopko told The Cable in a statement. "It is essential that the Department of Defense continues to implement strict controls over the fuel supply process to ensure taxpayer funds are not used in violation of Iranian sanctions." Funding for fuel for the Afghan security forces comes from the Afghan Security Forces Fund, which cost U.S. taxpayers $47.7 billion between 2007 and 2012. The Pentagon plans to give the Afghan security forces another $2.8 billion for fuel between 2014 and 2018, the SIGAR report states. In a response to SIGAR, two Defense Department agencies noted that they have not uncovered any direct evidence that vendors are acquiring fuel from Iran but the department intends to implement additional inspection measures and oversight of contractors. Vice President Joe Biden will meet Russian Foreign Minister Sergei Lavrov this weekend in Munich and National Security Advisor Tom Donilon will travel to Moscow next month to try to kick-start a new round of U.S.-Russia nuclear reduction negotiations, The Cable has learned. It was four years ago at the Munich Security Conference that Biden first spoke about the Obama administration's desire to "reset" U.S.-Russian relations after years of deterioration during the George W. Bush administration. Now, at the beginning of Obama's second term, Biden and Donilon are leading the charge to reinvigorate that reset, following a series of setbacks in the U.S.-Russia relationship that has included President Vladimir Putin accusing the United States of meddling in Russian politics, anger over a new U.S. law to sanction Russian human rights violators, and a new Russian ban on Americans adopting Russian orphans. At their meeting last March on the sidelines of the Nuclear Security Summit in South Korea, President Barack Obama was caught on a hot mic telling then President Dmitry Medvedev that after the November 2012 election he would have more "flexibility," a comment many interpreted to mean Obama would be able to sidestep potential political opposition to changes he wanted to make to America's nuclear posture and missile defense plans. In an interview last week in Davos with CNN's Fareed Zakaria, Medvedev explained that Obama was signaling he would have more negotiating power on these subjects, but said that the two countries were still quite far apart. "Any U.S. president during his second term can take a stronger position and act in a more decisive manner, and that is exactly what Barack meant," Medvedev said. "But if we talk about the subject itself, it is extremely difficult, and so far we don't see any flexibility. There are no easy solutions in terms of anti-missile defense. There is no flexibility. We have not changed our previous positions. The U.S. has one opinion, and the Russian Federation, unfortunately, has a different opinion. These positions are not getting any closer." Some in Congress are concerned that Biden and Donilon, in their upcoming meetings with Russian leaders, will define exactly what that "flexibility" might mean and propose unilateral reductions in U.S. nuclear stockpiles or alterations to U.S. missile-defense plans as an enticement for Russia to sit down for new talks. "Ahead of your unannounced discussions with Russian Foreign Minister Lavrov this weekend in Munich, and prior to Mr. Donilon's forthcoming February discussions in Moscow, I write seeking your assurance as to President Obama's plans for future potential U.S. arms reductions," Rep. Mike Rogers (R-AL), the chairman of the House Armed Services Strategic Forces Subcommittee, wrote in a letter to Biden Wednesday that was obtained by The Cable. Following the bitter and lengthy fight in 2010 over ratification of New START, the U.S.-Russia treaty that capped the number of strategic deployed nuclear weapons on both sides and renewed an intricate verification regime, Rogers and other Republicans are worried that the Obama administration might not pursue a new treaty, but rather strike a deal with Russia that won't have to be approved by Congress ... or just reduce U.S. nuclear stockpiles unilaterally. Rogers pointed out in the letter that as a senator in 2002, Biden joined with Sen. Jesse Helms to write to then Secretary of State Colin Powell to remind him that "with the exception of the SALT 1 agreement, every significant arms control agreement during the past three decades has been transmitted to the Senate pursuant to the Treaty Clause of the Constitution." "Mr. Secretary, we see no reason whatsoever to alter this practice," Biden and Helms wrote at the time. Donilon intends to transmit a personal letter to Putin from Obama "articulating his plans for further U.S. arms reductions and perhaps even agreements about U.S. missile defenses to entice Russia to the negotiating table," Rogers wrote. The National Security Staff and the Office of the Vice President declined to comment for this story and declined to offer any response to Rogers's letter. Russia experts acknowledge that a new arms control agreement with Moscow will be difficult but say that the White House is committed to exploring whether it is possible. Obama is personally driving this policy and sees nuclear weapons reductions, as spelled out in his 2009 speech in Prague, as part of his legacy. "The Donilon visit seems to be all about the next round [of nuclear reduction negotiations]," said Samuel Charap, a fellow at the International Institute for Strategic Studies who until recently worked in the arms control office at the State Department. "The president is serious about the whole Prague agenda thing. He wasn't making that up." There is no clarity on which types of weapons might be included in the next round of U.S.-Russia arms control negotiations, but the administration is said to be open to including strategic deployed nukes, strategic non-deployed nukes, tactical nukes, and missile defense in the talks. "The question is what kind of package you can put together with those four pieces to make a deal and what's the point of the deal," Charap said. "It's harder to make a compelling case to arms control skeptics here and there about why you need another agreement now. There's going to have to be a three-way balancing act between the interagency, Congress, and the Russians -- if the administration decides to pursue a new treaty." Stephen Pifer of the Brookings Institution recently released a report and an article spelling out some ideas for how a deal could be done outside the framework of a formal treaty that would have to be ratified by the U.S. Senate. The crux of the deal would be a cooperative agreement between NATO and Russia on missile defense, Pifer argued. "Experts from the Pentagon and Russian Defense Ministry reportedly held productive exchanges in early 2011 regarding what a cooperative missile defense arrangement would entail... Progress slowed in spring 2011, when Russia took the position that it required a ‘legal guarantee' that U.S. missile defenses would not be directed against Russian strategic forces," he wrote. "If Moscow is prepared to move off of its requirement for a legal guarantee, and Washington and NATO are prepared to show some greater transparency and flexibility in their approach, one can see the elements of a compromise that would allow agreement on a cooperative NATO-Russia missile defense arrangement." If the missile-defense issue were removed as an obstacle, a path toward an agreement on further nuclear weapons reductions would open up, the theory goes. The State Department's International Security Advisory Board (ISAB), which reports to acting Under Secretary for Arms Control Rose Gottemoeller, issued a report last November spelling out how further nuclear reductions might be achieved, with or without the cooperation of the Senate or the Russians. The ISAB presented options for three scenarios: "completing the New START Treaty reductions early; working with Russia on transparency and verification of nonstrategic nuclear weapons; and engaging in parallel nuclear arms reductions to levels below New START, if Russia is willing to reciprocate." "Unilateral and coordinated reductions can be quicker and less politically costly ... relative to treaties with adversarial negotiations and difficult ratification processes," the report stated. Administration critics are already preparing to fight any attempt by the White House to push forward with nuclear reductions absent the consent of the Senate. "Senators should block end-runs around the Constitution's treaty clause," wrote Bush administration officials John Bolton and John Yoo in a Wall Street Journal op-ed last month. "An informal agreement would prevent effective congressional scrutiny of the unwise rush to slash the nuclear arsenal, America's ultimate national-security safeguard and a crucial buttress of world peace." Former Nebraska Sen. Chuck Hagel testifies Thursday before the Senate Armed Services Committee as part of his bid to become the next defense secretary, and behind the scenes, senators are quietly lining up on both sides of the confirmation fight. The White House seems confident that Hagel, after gaining the public endorsements of key Democrats like Sen. Chuck Schumer (D-NY), is on a glide path to confirmation. Hagel has been working the halls of the Senate diligently, meeting with senators from both parties. Several key Democrats have announced their support and some officials argue that this foretells a confirmation victory for Hagel and President Barack Obama. "Senator Hagel's meetings on the Hill are going very well, and that's why you saw over the past two weeks a number of strong endorsements," an official working on the confirmation told The Cable, pointing to the strong support for Hagel within the Democratic caucus. But only one GOP senator has come out in support -- Sen. Thad Cochran (R-MS) -- and several Republicans have promised to oppose Hagel's nomination. Dozens of other Republican senators are keeping their powder dry, refusing to say on the record which way they are leaning. They are being lobbied hard by their colleagues and several well-heeled outside interest groups. Most undecided senators point to Thursday's hearing as the measure of whether or not they will ultimately support Hagel. But despite their reluctance to commit, staffers and operatives working on both sides of the confirmation battle have a good idea about which senators are likely to vote which way. Some GOP senators have firmly stated their opposition to Hagel's confirmation and will not back down. They include Sens. James Inhofe (R-OK), David Vitter (R-LA), Roger Wicker (R-MS), Tom Coburn (R-OK), Pat Roberts (R-KS), Dan Coats (R-IN) and John Cornyn (R-TX). Asked Tuesday if he would block Hagel or just vote against him, Inhofe said, "One step at a time." Cornyn is said to be leading the anti-Hagel effort inside the GOP caucus, according to multiple Senate aides. In a brief interview with The Cable, Cornyn said he was talking to other senators about Hagel "just on a personal basis." "It's not a leadership position, but I'm opposed to the Hagel nomination," he said. Several other GOP senators have strongly indicated they will oppose the Hagel nomination but have not explicitly promised to vote no. Sen. Lindsey Graham (R-SC) has criticized the nomination several times and said this week he would block a vote until Defense Secretary Leon Panetta testifies on Benghazi, though a hearing is not yet scheduled. Sen. John Barrasso (R-WY) penned a blistering Wall Street Journal op-ed criticizing Hagel last week. Sen. Pat Toomey (R-PA) has said he has "deep concerns" about the Hagel nomination. "We had a nice, healthy talk. Y'all just should just show up Thursday," Graham said Tuesday after meeting with Hagel. A limited number of GOP senators are now the target of intense lobbying because they have not clearly indicated, even privately, which way they are leaning. Sens. John McCain (R-AZ) and Bob Corker (R-TN) are the two most influential in this group. McCain, a former "close friend" of Hagel's, has been critical of the nominee's stance on Iran, while Corker, a staunch supporter of nuclear modernization, has repeatedly and disapprovingly invoked Hagel's commitment to nuclear force reductions. "It was a pleasant conversation," McCain said Tuesday after meeting with Hagel for 45 minutes. Asked if Hagel had addressed his McCain's concerns, McCain said, "No he has not." Corker met with Hagel Jan. 25 for 53 minutes and still declined to endorse him for the Pentagon job. "These hearings matter a great deal to me," Corker told The Cable. "I spent a lot of time with Hagel on Friday talking about nuclear modernization... You shouldn't take pro or con from this conversation." The Cable asked Corker if Hagel was modifying his positions on subjects like Iran, Israel, and nukes out of political expediency in order to get confirmed. "That's a very good point and we'll certainly be tuned in to see if that's the case," Corker replied. Other fence-sitters include Sens. Susan Collins (R-ME), Lisa Murkowski (R-AK), Lamar Alexander (R-TN), Rand Paul (R-KY), Saxby Chambliss (R-GA), Richard Shelby (R-AL), Richard Burr (R-NC), Orrin Hatch (R-UT), Chuck Grassley (R-IO), and Johnny Isakson (R-GA). Senate Minority Leader Mitch McConnell (R-KY) has also not weighed in on the Hagel nomination. Collins met with Hagel for 90 minutes last week and told The Cable Tuesday she would reserve judgment on the nomination until after the hearing. "We had a good discussion, but it's obvious that we have very different views on some fundamental issues," Collins said. "So I want to hear more from him on a number of issues and the hearing affords that opportunity." The anti-Hagel forces are keeping up the pressure, for example by having 400 members of the group Christians United for Israel lobbying senators on Capitol Hill this week. There's a wide recognition that Hagel's confirmation hearing is going to be contentious. Senate Armed Services Committee Chairman Carl Levin (D-MI) said this week that there might actually have to be two hearings to air all the committee members' concerns. "It depends on whether we don't have enough time, or something shows up [during the back-and-forth] that requires a second hearing," Levin said. Even with dozens of GOP senators voting no, the conventional wisdom remains that Hagel will ultimately get confirmed, even if it is with a historically low, but nevertheless filibuster-proof majority. For Hagel's opposition, the best-case scenario is that only a few Republicans break ranks and a couple of Democrats do break ranks, giving the Hagel opposition the 40 votes needed to filibuster the vote on the nomination. They recognize that is unlikely and a filibuster of a cabinet nominee is extremely rare, but they plan to continue their effort well past Hagel's confirmation hearing, hoping that more embarrassing quotes from Hagel's past surface or a new scandal comes to light. "There's a lot of White House spin about Hagel's clear path to confirmation, but they have a real fight on their hands -- and they know it," one GOP source close to the committee said. 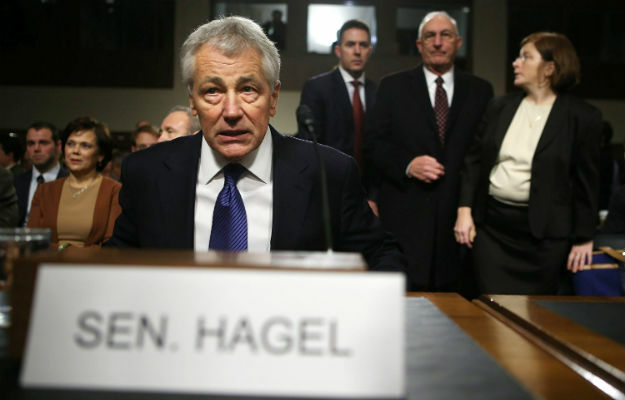 For the team of officials, staffers, and outsiders working to bolster the Hagel nomination, they believe that Hagel's Thursday testimony will take the wind out of the sails of the opposition and set the record straight on the former senator's views. "It's unfortunate that you have a number of senators that decided to take a very public very aggressive position weeks ahead of the confirmation hearing without actually speaking to the nominee," one Hagel supporter close to the process told The Cable. "This hearing is the first honest opportunity for Hagel to explain his positions, defend his record out in the open, and he will forcefully address much of the misinformation about his record that has been advanced by a small minority of folks on the Hill." "We think we are in a good, strong position going forward, but nobody takes anything for granted in this business," an official working on behalf of the confirmation effort added. The State Department will soon have a new coordinator for all sanctions around the world, Ambassador Dan Fried, who until now has been working on resettling prisoners from Guantánamo Bay and relocating a hard-line Iranian dissident group known as the Mujahiden-e-Khalq (MEK). Fried is set to take over much of the sanctions portfolio from Bob Einhorn, who will stay on at the State Department and focus on nuclear diplomacy with Iran, a State Department official told The Cable. Fried will move into Einhorn's office and start to build a new staff of about six to eight people, along with a new deputy, former National Security Council staffer Richard Nephew, the official said. Fried's responsibilities will not mirror Einhorn's exactly, the official said. Whereas Einhorn dealt primarily with sanctions against Iran, North Korea, and Syria, Fried will have influence in coordinating sanctions also dealing with countries ranging from Cuba to Burma to Russia and beyond. In some cases, such as with Burma, Fried will be managing the lifting of sanctions. "Part of the theory is that there are sanctions tucked away all over the place, so you need an office where you can pull it all together and see what works," the State Department official said. "The strategic purpose of sanctions is to not have to do them anymore." As the New York Times reported Monday, Fried's previous office, which worked to relocate Guantánamo prisoners to third countries, will now close. Fried's travels around the world had resulted in the repatriation of 29 low-level prisoners to their home countries and the settlement of 40 others to third countries that were willing to take them in. That work will now be transferred to the office of the legal advisor, the State Department official said. There is a recognition that the work of resettling Guantánamo prisoners is largely over. "Because of the congressional restrictions, there's not a lot of work left that can be done," the official said. "There are a few left to be transferred to third countries, but not too many." Fried had also been instrumental in the effort to convince the MEK, which had been a State Department-designated foreign terrorist organization until last October, to move out of its secretive Iraqi home near the Iranian border, called Camp Ashraf. The MEK completed its move to Camp Liberty, a former U.S. military base near the Baghdad airport, late last year. Under Secretary of State for Political Affairs Wendy Sherman will continue to lead the diplomacy related to Iran, aided by Einhorn in his new capacity. The administration's WMD Czar Gary Samore will leave the administration to become the executive director of Harvard's Belfer Center, the university announced in a press release today. No replacement for Samore has been named. All contents ©2013 The Foreign Policy Group, LLC. All rights reserved.